Top community discussions about Hijack iT! Is there a better alternative to Hijack iT!? Is Hijack iT! really the best app in Audio category? Will Hijack iT! work good on macOS 10.13.4? Hijack iT! is a tool that leverages iTunes and Audio Hijack Pro to create a simple tool for converting all the media in any iTunes playlist. What's New in Hijack iT! Added option to minimize AHP and iTunes while running. Added option to quit AHP and iTunes when exiting. Added ability to refresh iTunes playlists and Audio Hijack Pro Sessions after adding or removing items from those lists. 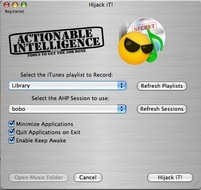 Mac OS X 10.4.4 or later (tested with 10.4.5 Intel), Apple's iTunes 5 or later (tested with 6.0.4), Registered copy of Rogue Ameoba's Audio Hijack Pro 2.5 or later (tested with 2.6.5), Growl (tested with 0.7.4). See more reviews for Hijack iT! 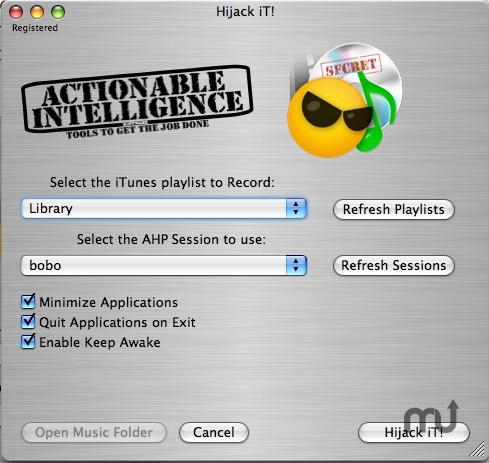 Using Audio Hijack Pro on its own you can not easily convert, apply filters, etc. to multiple tracks from iTunes in an automated fashion. This tool allows you to setup an Audio Hijack Pro template that not only can be used to convert media, but can also be used to apply sound effects/filters to the music, break the audio files up into conforming sizes (every 30 minutes or something) for long files, etc. When you launch the tool and select a playlist each track in that playlist will be captured using the Audio Hijack Pro template you have setup. Each track will be named properly and saved in the location defined in the template. Due to the usage of GUI scripting there are currently a few quirks, but under most circumstances this works very well. Known issues are discussed in the ReadMe. There are quite a few formats supported by iTunes that many digital players don't support and some that are simply non-standard and/or propietary. This makes converting those formats to standard, non-proprietary formats simple and automatic. It doesn't alow you to do anything you couldn't already do manually with iTunes and Audio Hijack Pro, it simply automates the process.